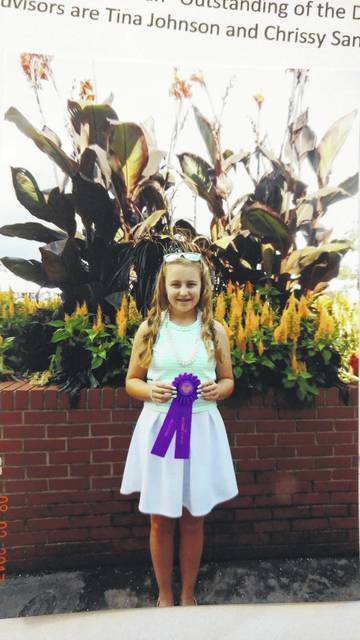 Olivia Harrison, a member of Early Birds 4-H Club, competed at the Ohio State Fair with her clothing project “Look Great for Less.” After participating in judging and a fashion review, she received an “Outstanding of the Day” rosette. Her advisors are Tina Johnson and Chrissy Sanders. https://www.mydailytribune.com/wp-content/uploads/sites/42/2017/09/web1_0914172117.jpgOlivia Harrison, a member of Early Birds 4-H Club, competed at the Ohio State Fair with her clothing project “Look Great for Less.” After participating in judging and a fashion review, she received an “Outstanding of the Day” rosette. Her advisors are Tina Johnson and Chrissy Sanders.